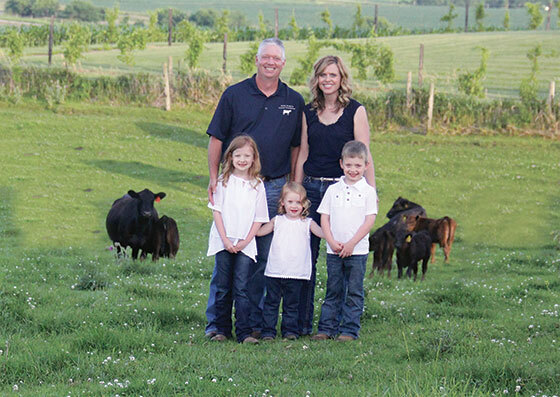 The Doty Angus Cattle Company is family owned and operated by myself, my wife Melissa and our three children Madelynn, Jack and Molly who love working with the cattle. Our natural Black Angus beef is from animals that have received no antibiotics in their feed and have no growth implants. In contrast, some beef that you buy in the grocery stores comes from feedlots where the feed is “medicated” with antibiotics and the animals receive estrogen growth implants. Angus is the name of the breed – a black English breed renowned for its beef quality. Our farm also focuses on breeding stock, meaning we control the genetics of our animals to further enhance the Black Angus’ quality. Three generations of Dotys have proudly preserved our land and managed our herd for optimum rib eye size, marbling, tenderness and other indications of premium beef – a difference you will experience with the first bite. Why is Doty beef SO good? There’s no secret – in fact – that’s the point – we’re proud of our careful management! We feed our small herd of Black Angus cattle a select diet of hay, corn and silage for ultimate health and superior flavor. And because we are a small family producer, we are able to tend to each animal on a personal level until they reach a prime grade. The quality assurance continues with our dry aging process that enhances and intensifies the natural beef flavor. In fact, only two Iowa lockers have met our family’s personal standards, so the best beef is transformed into the best cuts for your kitchen!